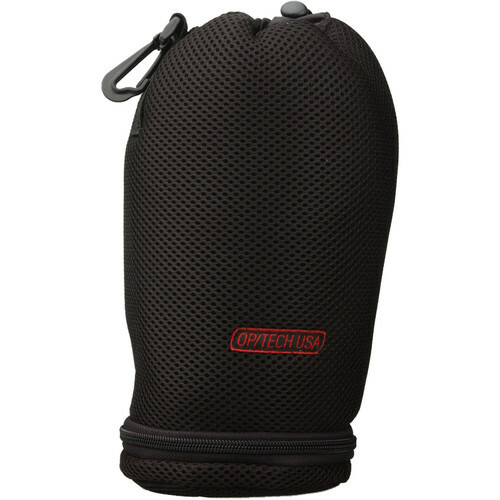 Fits Lenses and Filters up to 8.5"
The OP/TECH USA Lens/Filter Pouch, Large (Black) is designed to carry a lens up to 8.5" and up to 2 filters. The pouch is made of neoprene with a microfiber lining. There is a zippered filter section with a padded protective divider that holds up to 2 filters and a wide-mouth lens section that holds a lens with a sunshade. It has a drawstring closure and a padded dust flap. It can be carried by using a snap attachment or a belt loop. Box Dimensions (LxWxH) 10.0 x 6.0 x 1.5"
Lens/Filter Pouch, Large is rated 4.4 out of 5 by 12. Rated 5 out of 5 by Quinny from Great Value and Performance I bought this pouch to protect a 70-300MM lens that was a substantial investment. The pouch performs perfectly as a protective case and has some very practical features as well. I found the belt clip to be very handy and I started to use that rather than lugging around my gadget bag. It was very convenient to change lenses without having to keep going into my bag. I found the filter compartment on the bottom to be handy too, but just be careful not to open it too fast or you might drop one like I did. Rated 3 out of 5 by dcisive from Fits My Sony 70-200G f4 But Very Little Protection I was struggling over which quality neoprene type pouch would fit my unusually sized Sony 70-200G f4. I decided to try this as it looked substantial. I was disappointed to find it is nearly NO padding compared to a basic neoprene type pouch let alone many of the more padded variety of cases. It offers no advantages to the supplied wanna be leather like pouch. Oh well. I had to try to see if it would work. It doesn't get my recommendations as I feel any pouch you get should provide substantial protection against bumps at least. Rated 5 out of 5 by Anonymous from Good choice I was looking for a bag to hold my L70-200 which fits perfectly. I like that the bag is sturdy and affords lots of protection with the thick yet flexable neoprene. Thus it will be comfortable to wear around my body. The bag has a convenient hook as well as a belt slide. Rated 4 out of 5 by Sugarlander from A low cost and well-made big lens pouch A low cost and well-made big lens pouch can be used for all kinds of large lenses plus 2 filters: Canon 70-300mm f4-5.6 IS Canon 70-200mm f4L Canon 70-200mm f2.8L IS I/II It also fits any backpack well for travel needs. Rated 5 out of 5 by jjs from Excellent product I used this pouch to keep my Nikkor 70-300mm lens safe while it is in my backpack. Very well made and designed. Love that it has a filter section. That way my polarizing filter stays with my lens. Rated 4 out of 5 by Julio, man on the streets from met my needs perfect size for my 200mm canon FD lense. just came back from trip in Yucatan and the pouch was perfect. it would have gotten 5 stars if the foam was as dense as Op/Tech's camera pouches. Rated 5 out of 5 by Anonymous from Does what its suposed to. You can store two filters in the bottom. Good idea. Will this fit Canon EFS 55-250mm lens with attached hood? Yes, this OP/TECH lens pouch will fit the EF-S 55-250mm with a lens hood comfortably. Does this fit the Canon 70-200mm 2.8 IS II with the lens hood attached in reverse? How are the filters protected?